Kowhaiwhai Design: Based on ‘Mangotipi’, The white pointer shark. For me this design represents strength and determination. The flint lock musket: The first muskets were traded by the earlier visitors to New Zealand, the whalers and sealers. Up till about 1840 missionaries estimated the lost of Maori lives by directly or indirectly introducing muskets was approximately 80 000. Mau Raku – To grasp a weapon. A traditional Maori martial art complemented by Mau – hand to hand combat. 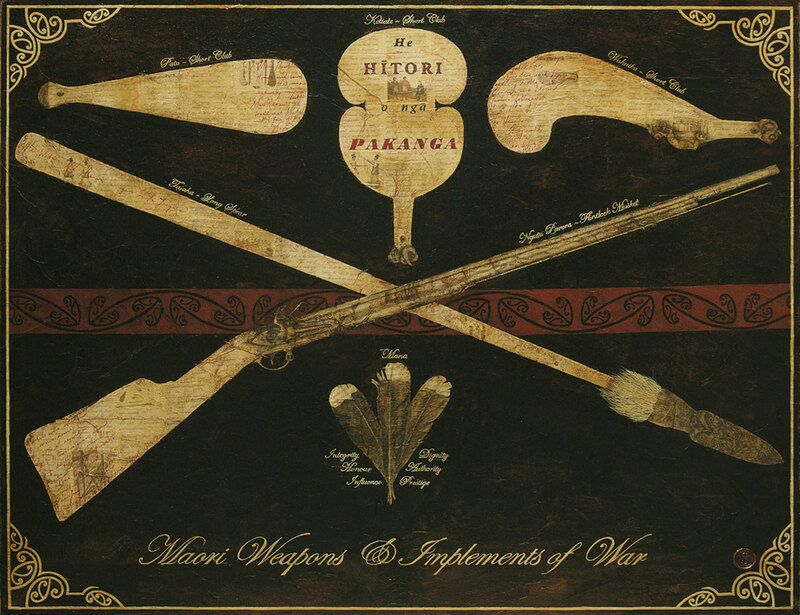 War was a splendid thing for Maori. A great deal of ‘mana’ could be gained by a warrior who fought well in a battle. Mana was part of everyday life for the Maori. It means different things in different circumstances; Honour, Prestige, Authority, Psychic Power, Influence, skill or nobleness. Mana could be lost or gained. A greenstone mere (short club) could have high levels of mana due to it having been passed down through generations of chiefs or possibly having killed important people.